Before we start, it is important to note that this backpack will not only be fit to Phantom 4 drone, but also all other Phantom models. Continue reading through this intriguing review and find out whether DJI Phantom 4 Backpack is the right storage option for your Phantom drone. Its ergonomic design makes it look no different than other backpacks available on the market. That means that you can use it for any occasion. The backpack is black, which is ordinary but nonetheless elegant. It is made of a durable and sturdy material, which doesn’t make it too heavy in the process. It weighs a tad more than 3 pounds which will make it easy to carry it on the go, whether you’re on the car, hiking or on a bike. Other backpacks have this extreme problem with weight, so customers usually get turned down because the drones usually tend to be not as light. A lightweight backpack means less applied force on your back, and thus more enjoyable. The lightweight design is not only perfect for the outdoor adventure, on a bike or while hiking. The featherlike ergonomics come in use when you are traveling and forced to lug it across the corridors on the airports. The company claims that this is the most lightweight backpack on the market. While we can’t confirm it, we really enjoyed how portable it is. Koozam DJI Phantom 4 backpack is equipped with something all other, even casual backpacks should be equipped with – the anti-theft feature. What does that mean? For instance, when you are traveling you can protect your drone and all other necessities with the help of the zipper for main compartment. This zipper is located on the side which is by your back and between the shoulder straps. You will literally make it impossible for the thieves to approach you and quickly steal necessary things from your backpack. Rain is really a cruel enemy to all electronics. However, rest assured that your Phantom 4 will stay protected throughout its use. We conducted various tests to confirm that the backpack is waterproof and that it won’t let any water inside. Tested included pretty much everything. From riding a bicycle on the rain to throwing the backpack into a shower itself. All tests were conducted, hence there’s no reason to worry about the drone getting splashed and by that damaged by the water. As mentioned above, the company made a mistake by noting that this is strictly DJI Phantom 4 backpack. It can support its predecessors too. However, it’s probably not recommended with Phantom 4 Pro and Phantom 4 Pro Plus. While it doesn’t take long to fit everything you need, it requires a little effort to place Phantom 4. Nevertheless, soon enough you’ll have your drone, your batteries, cables, controller and tablet neatly packed up, with still some space left in the backpack. It’s important to note, that maybe some smaller and older versions of Phantom will be able to support the props inside. In case of Phantom 4, and other larger drones, it’s important that the propellers are removed so it doesn’t come to damaging. The backpack can support three batteries, together with the one that’s on the drone that means four batteries. The most important trait is comfort. When first looking at it and comparing its weight we noticed that the backpack could be pretty comfortable. However, we had to test it too. We conducted various tests which included hiking and riding a bicycle. Walking everyday around three hours was enough for us to determine that it’s extremely convenient and suitable for long-term use. It’s worth mentioning that our tests took place outside, in the city, in the parks, and up and down stairs. Backpacks are not always as comfortable as thought. However, Koozam’s DJI Phantom 4 backpack was mere surprise, as long as you can fit your Phantom 4 in. DJI Phantom 4 backpack is really a great storage option for your Phantom drone. However, it’s not perfect, and here are its advantages and flaws as opposed against other competing backpacks on the market. The backpack, as mentioned above, isn’t as perfect as Phantom 4, but earlier Phantom versions instead. While the packing process is pretty fast, it won’t be as effortless as it is for the smaller and older models. While there are cheaper models that are available on the market, there are not as comfortable and spacious models as this one. Furthermore, DJI Phantom 4 backpack comes with a unique set of features which will indeed come in handy to many users. The waterproof and anti-splash features will come in great hand when exposed to rain or using your Phantom 4 in humid environments. That being said, Koozam DJI Phantom 4 Backpack is a great value for the money and if you’re undecided between this model or some other, hopefully this review helped you. The drone market is pretty large and Koozam DJI Phantom 4 backpack exceeded our expectations. Whether you use older models or original Phantom 4, you can make great use out of this backpack, especially if you’re looking for something to use in absolutely any environment. DJI Phantom 4 backpack is an inexpensive storage option for your Phantom drones. 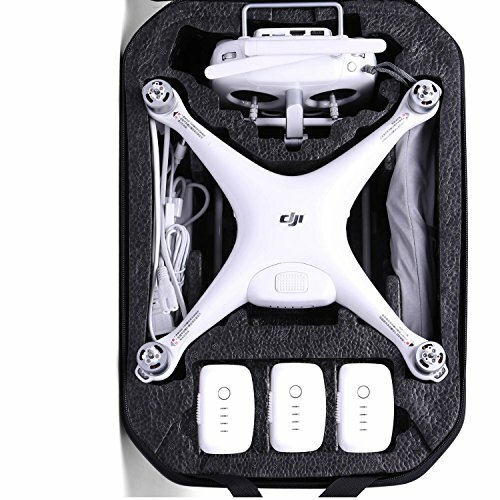 It comes with a great variety of features, including anti-theft protection, which is an additional set of zippers to protect your drone from theft, storage option for three additional batteries. Moreover, backpack is 100% waterproof. Its pricing won't empty your wallet, so it's also a great value for the money.